To eat food without understanding its origin is like having food without flavor! At the foot of Mount Ymittos, there is a neighborhood called Kaisariani. 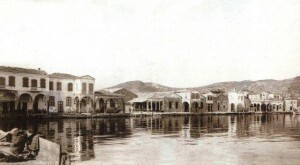 It is at the eastern outskirts of Athens proper, bordering Pagrati. In 1922 the great “population exchange” took place between Turkey and Greece. The big powers of the time had decided that the Greeks of Asia Minor, now Turkey, would be better off amongst their own people and the Turks that lived in Greece would be happier in Turkey. The truth of the matter is no one asked these people, who, for hundreds of years, had coexisted with one another. The people of Asia Minor had lived together in the same cities, Greeks, Turks, Jews, Europeans… . They rarely intermarried and stayed in different neighborhoods, but they interacted, they traded, they were friends. The term “population exchange” is a benign term and in no way depicts the horrors of forced marches, burned properties, uprooting of families, and atrocities that occurred, etc. etc. etc. None the less, the Greeks from Asia Minor came “home”. Home is a familiar place, a place with memories, a place where ancestors are buried, a place where you are welcome. None of this was true for the prosfyges [refugees]. They left a country and a home they loved and came to a place where they were strangers and disliked. For even people who share a common language, religion, history and background do not always get along. In any case, those who made it through those trying times settled in areas on the outskirts of Athens that came to be known as Kaisariani [named for the town of Ceasaria in modern day Turkey], Neos Kosmos [New World], Nea Ionia [New Ionia], Nea Smyrni [New Smyrna, modern day Izmir] and other places outside of the then Athens proper. They lived in shanty towns in poverty. The once very prosperous Greeks of Asia Minor, stripped of their wealth, had become paupers. One thing that no one can take away from another person is their dignity, their intelligence, their willingness to work, to make sacrifices and their will to live. In a very short time, against all odds, through wars, German occupation, civil war, post civil war turmoil, junta, with everything stacked against them, they persevered and they prospered once more. In their new “home” land they brought along with them their customs, their traditions, their culture and their cooking. Anyone that has read or sampled ancient recipes and traditional Greek recipes will tell you it was a very simple fare. Very simple ingredients, very simple preparation, rather bland. But the people of Asia Minor once lived at the end of the spice road. They had at their disposal spices unheard of in the land today known as modern Greece. Pepper and cinnamon and cloves and allspice and cumin and a thousand other spices. They had a cuisine still unrivaled the world over. “Eat at a Turkish house and sleep at a Jewish house” is an old Greek saying, meaning that the cuisine of Asia Minor was exceptional and the Jewish households had the best furnishings. And recently, in Kaisariani, now a thriving suburb which borders our Pagrati neighborhood, we stumbled upon Triantafylia, who in her tiny kitchen at “The Vourliotina” (they have a great web site, unfortunately no English but great food photos and music) continues to prepare and serve recipes spiced with the flavor of Asia Minor. Perhaps it is kismet that a woman named for a beautiful, fragrant flower, (Triantafylia means rose in Greek), should end up creating dishes so full of interesting flavors – from the rich red pepper spread served in trio, along with thick crusty bread, with reduced balsamic vinegar in olive oil and the tiny, delicate cheese balls crusted with black pepper – to the masticha cream topped ravani (honey cake) we were treated to for dessert, and everything that we sampled in between, her love affair with food and flavors shines through. 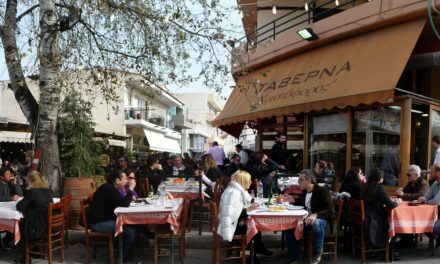 Her grandmother, Triantafylia, came from Vourla – a suburb of Smyrna – to Greece with only her Bible and an icon which granddaughter Triantafylia keeps close to her, in the place she loves most, her restaurant. Triantafylia, her husband and her son run the small restaurant in Kaisariani, just one block off of the busy intersection of Ymittou and Formionos streets, a few blocks from the Divani Caravel and Hilton hotels, yet a thousand miles away from the typical “Greek cuisine”. It is understated, you won‘t find it unless you know where to go. We found it by chance last Easter week when we were the only diners that night. Greek Orthodox people fast during Holy Week and eat at home. Few dine out and most restaurants frequented by locals offer a paired down “nistisimo” or “fasting” menu. They brought us the menu. The law requires it. It looked great! Dishes and items that I had never heard of. “Anatolitiki kouzina” [Eastern cooking] is what we call it, meaning spices, flavors, combinations of ingredients that are outside the usual Greek fare. A side note about all Greek restaurants: The law dictates they have to present you with the menu. It does not dictate that the items on the menu have to be available. So ask your server what is really available. You may find out there are things offered that are not on the menu. Usually, those are the ones I pick. Nikos, the son and waiter, informed us that only a few things were available. What we ate was very good. We marveled at the light and fluffy béchamel covered seafood pastichio, wondering how so rich a flavor could be created with no eggs, milk or cheese (the secret ingredient, soy cheese!). 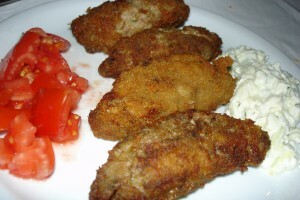 We munched cheeseless kolokythokeftedes, [zucchini fritters], tomatokeftedes [tomato fritters] and cabbage salad. We promised ourselves and them we would be back. A few months later we went back. 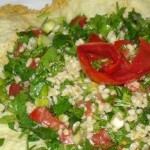 We had tabouli, a bulgur salad with large amounts of parsley [a natural diuretic], tomatoes tossed in a light olive oil and vinegar dressing served on fried kefalotyri cheese crisps, a very refreshing salad with a twist. That’s when we decided that the person in the tiny kitchen must really love food. So many items to try. We wished there were more people to share more things. From the impressive list of keftedes [from the Turkish kiofte, anything that is rolled into a ball and fried] we tried the kolokythokeftedes, [zucchini fritters] and the melinzanokeftedes [eggplant fritters]. A true vegetarians’ paradise. 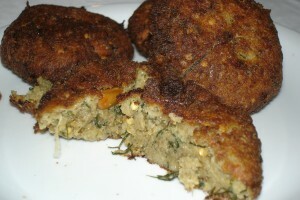 Eggplant, zucchini, tomato, fava and chickpea keftedes – too many to try in one sitting. They also have the traditional meat keftedes and a specialty called Passa Kiofte [a mixture of ground beef and pastirma –dried beef prepared with crushed cumin, fenugreek, garlic, and hot paprika fried to a crunchy crisp on the outside with a very moist center. Perfect for ouzo. The food came one item at a time, allowing us to pace ourselves, a real treat in Greece where everything is often served at once, and everything comes out HOT. One of the prevalent flavors was cumin, which I found out later they roast and grind in the restaurant. We also had the house white wine, very refreshing, a good blend with the flavors of the food. This is the unassuming kind of wine. No deep secrets, no hidden flavors to discover, just good wine to go along with great food. The bill came to €33. Although we were stuffed with the four appetizer items we chose, we didn’t refuse when Nikos placed 2 delicate kir glasses filled with fragrant strawberry liquor and a plate of sweets before us. Ravani, a traditional spongecake soaked in a sweet syrup, takes on new flavors when topped with a creamy mastcha flavored crème. Next to this, 2 simple squares of dense custard topped, of course, with rose jam. We will go back. 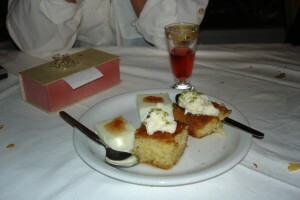 This time we will try some of the main items such as Triantafylia’s Stamnato and the Passa Kiofte accompanied with ouzo. Vourlitina is located at Ymittou & V. Alexandrou 10 in Kaisariani, tel 210 72.91.545. Closed on Mondays. This was by far the the best food I’ve had in Athens so far (I’ve been here for 2 months). Just wanted to say thanks for the recommendation. It was a little tricky to get to but worth the effort.